In circumstances like these it might be easy to repeat the Bianconeri adage, “Juventus never give up“. It’s one that fits. “Character” is one of the single most marking characteristics of this team, and the way Juve achieved their victory over Catania today can only reinforce that image (just like their Coppa Italia match did earlier this week). Good fortune however (commonly known as “luck”) was a strong contributor today as well. Playing with 10 men for almost 80 minutes of play the Bianconeri managed to steal away the three points right into stoppage time, a close-range redirect that ended a streak of two consecutive home league losses and keeps the evil Inter rivals within reasonable reach. Also of all people, the unlikely match-winner was last Summer’s most criticized Bianconeri recruit. In a period where everyone eagerly awaited the arrival of Xabi Alonso, the black & white fans had to settle for a rugged Danish defensive mid, a player whose fame in Italy was exclusively limited to a close encounter with Totti’s DNA during Euro 2004. And today him of all people, was Juve’s saviour. Tactically, both managers veered the most classic of formations today: 4-4-2. Alessandro Potenza made his debut for the Rossazzurro, while Camoranesi & Tiago returned to active duty after a lengthy injury break. Up front, Ranieri rotated his squad and fielded the unusual Iaquinta-Amauri pair, while Del Piero & Trezeguet occupied their place on the bench. The match debut was instantaneous and the initial minutes rapidly set the pace for things to come. First Stovini (short-range redirect) and then Morimoto (one-on-one chance) gave Bianconeri fans their first scares of the day, and on the latter chance Buffon had means once again to show why he’s the world’s best. And the day was only getting started. From minutes 11 to 13 the turning point: Vincenzo Iaquinta first put his team in the lead (powerful header on a nice Camoranesi cross) and then left his team with 10 men, after an unnecessary foul at the halfway line. Second yellow (his first was bestowed for removing his shirt in post-goal celebrations) and early shower for the ex-Udinese man, smiles on the Bianconeri fans were wiped in an instant. 1-0 Juventus but for how long? As expected, Juve retreated back into their trenches after seeing red, allowing Catania to progressively grab hold of ball possession & match pace. Fortunately Buffon was wearing his super-gloves today, saving his team’s lead with a miraculous short-range save on Potenza and then repeating himself on Martinez shortly before the break. On the other end Amauri was doing as best he could, exploiting his physical strength & ball control to occupy the entire attacking area all by himself. Juve suffered, but held their lead tight at half time. In the second period Walter Zenga decided to push his troops further up: exit 4-4-2 and enter a 3-4-3 formation. More strikers, more dare. Inevitably, more goals. Just 6 minutes in, Takayuki Morimoto pounced on the rebound spilled by Buffon (after a powerful Mascara header) and tied things up at Stadio Angelo Massimino. 1-1. After the equalizer, the Rossazzurro really threw themselves forward in order to capitalize on their man-advantage. Buffon continued his phenom-work but was also a bit aided by his guardian angel, who directed Baiocco’s effort onto the woodwork and prevented the referee from seeing a Marco Marchionni handball inside the Juve box. Tense moments followed in Sicily, as the match trickled towards the 90th minute and Juve hoped to hold their draw tight. And then in the first minute of stoppage time, an unexpected gift: Juve got a corner-kick. A re-directed header by Amauri and a fumbled clearance by Terlizzi later, Christian Poulsen had slammed the ball into the net. 2-1 Juventus, black & white fans smiling again. GOALSCORERS: 11’ Iaquinta (J), 51’ Morimoto (C, 91’ Poulsen (J). CATANIA (4-4-2): Bizzarri – Potenza (80’ Terlizzi), Ma.Silvestre, Stovini, Capuano (33′ Martinez) – Izco (70’ E.Carboni), Baiocco, Biagianti, Gia.Tedesco – Mascara, Morimoto. (bench: Kosicky, Paolucci, Silvestri, Spinesi). Coach: Zenga. JUVENTUS (4-4-2): Buffon – Grygera, Legrottaglie, Mellberg, Molinaro – Camoranesi (51’ Marchionni), Sissoko, Tiago (83’ Poulsen), Nedved – Iaquinta, Amauri. (bench: Manninger, Ariaudo, Giovinco, Del Piero, Trezeguet). Coach: Ranieri. 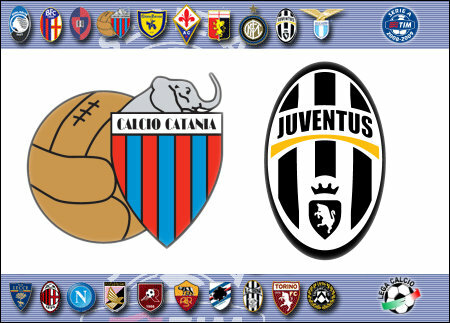 This entry was posted on Monday, February 9th, 2009 at 1:06 am	and is filed under Catania, Juventus, Serie A. You can follow any responses to this entry through the RSS 2.0 feed. Both comments and pings are currently closed.